The team at Park Rose Animal Hospital is comprised of highly trained and experienced animal health professionals who have a genuine love for working with pets. Our staff treats every patient with the highest quality of medical care as well as a gentle touch. Naushadali Kugashiya, DVM is the lead veterinarian and owner of ParkRose Animal Hospital in Roselle, Illinois. 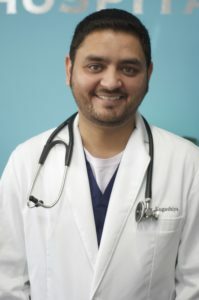 Dr. Kugashiya (or Dr. K as he is sometimes called) graduated from Gujarat Agricultural University in India and has been working in veterinary field in the Chicagoland area for 7 years. He grew up on his family’s farm in India and took in an interest in helping take care of the many animals. After graduating vet school, he moved to the Chicago area in 2007. His medical interest include internal medicine, dentistry, soft tissue and orthopedic surgeries. As an active member of American Veterinary Medical Association (AVMA), he continues to participate in multiple continuing education seminars and national conferences. Away from the hospital, Dr. K enjoys spending time with his wife and son, catching up on his favorite TV series, trying different cuisines, and going to the movie theaters.